With the sun beating down upon glass-like seas, the flags of two of the United States’ finest Ships could be found fluttering in a calm breeze in the Arabian Gulf during the recent Operation Falcon Strike. 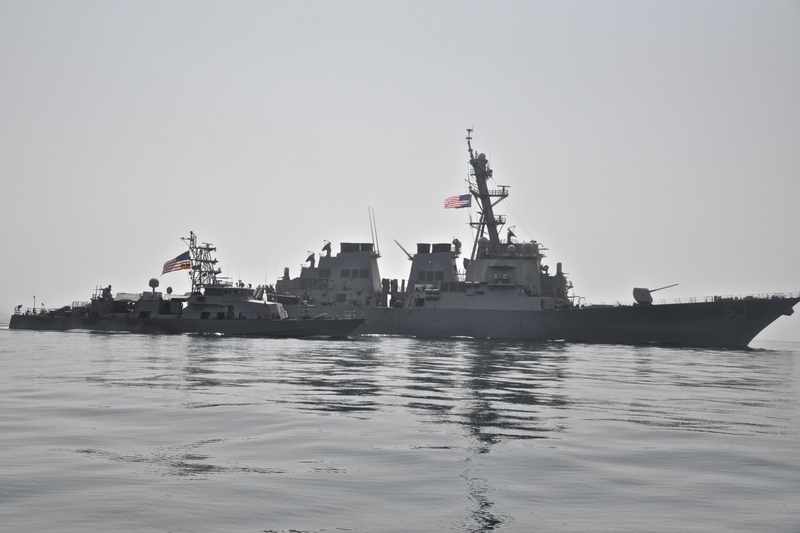 USS Stethem and USS Typhoon, part of the Combined Maritime Forces, recently conducted an intense day of operations to bolster the safety and security of ships and sailors operating in the Arabian Gulf. 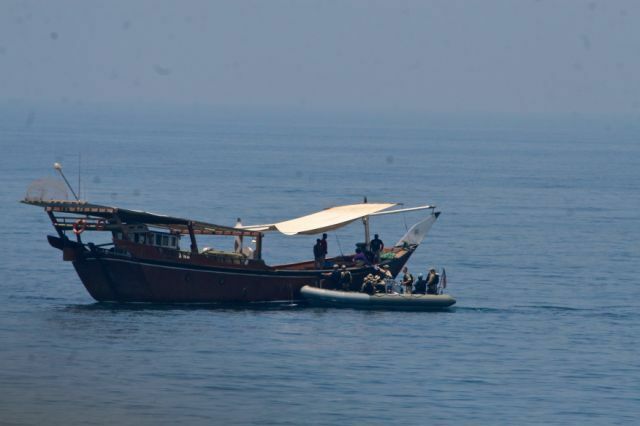 The operations focused on determining recent trends in crime and piracy in the region. Crews from the Stethem and Typhoon communicated with large-scale commercial ships transiting the area and conducted alongside visits with the Arabian Gulf’s local commercial fishing fleet, known as ‘dhows’. ships and sailors operating in the Arabian Gulf. Throughout the course of the operation, Stethem and Typhoon employed their respective teams to visit the local fishing community, fostering positive working relationships with mariners. The teams consist of 6 main crew plus a search and rescue swimmer, boat coxswain and boat engineer During these visits, the team is careful not to disrupt the dhow’s daily work but offers first aid to crew members, provides cursory safety inspections to ensure the seaworthiness of the fishing vessels, and interacts with fishermen to learn of any recent crime or piracy within the area. The Combined Task Force 152 mission is one familiar to the USS Stethem. Since her arrival in the Fifth Fleet area of responsibilities in April 2012 she has been actively contacting and collecting information on maritime traffic. During this most recent day of focused operations, combined forces learned that maritime crime and piracy remain a pervasive threat to the local working population. In each instance, the local fishermen were thankful for Combined Task Force 152’s presence and welcomed their efforts to provide safe and secure seas for fishing and trade. It is a mission and service that Combined Maritime Forces’ ships and staff are proud to provide. Combined Task Force 152 is commanded by Captain Stephen Evans and is headquartered in Bahrain.